It certainly seems that if you wait long enough, just about everything comes back in fashion after about 25 years or so. An anecdotal case in point would be tie-dye t-shirts. I could have puked when they came back into fashion sometime around ’05, and my mother told me how many hundreds of shirts she had thrown away, thinking they would never come back. So it seems also with the chopper look that was so popular in the ’60s and ’70s. The difference now is that manufacturers are producing showroom choppers with rake values that come close to some of the radical rides from that era. I haven’t seen any genuine stretch in the downtubes yet, but there’s always next year I suppose. 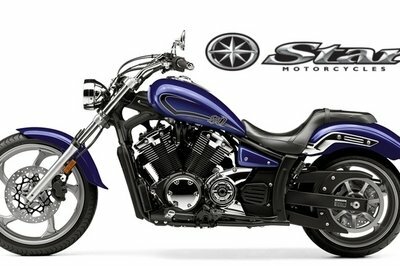 Star — now folded back under the Yamaha umbrella— introduced the Stryker back in 2011 to take advantage of the resurgent popularity of the chopped look, and here we are in 2017. The “showroom chopper” race is definitely heating up with more manufacturers looking to break into the niche, so let’s take a look at the Star contender in the form of the Stryker. 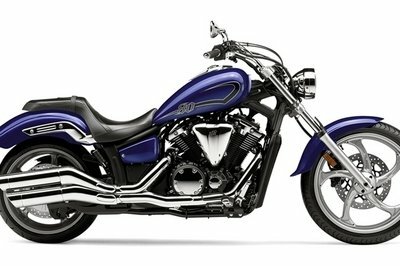 Continue reading for my review of the Yamaha Stryker. Long and low, the Stryker family comes with a dose of nostalgia added liberally thereunto. The big, V-twin engine, bobbed fenders front and rear, and of course, the steering head rake take us right back to when Motown was King, and the outlaw bike culture was thriving on U.S. soil. The big, V-twin engine, bobbed fenders front and rear, and of course, the steering head rake take us right back to when Motown was King, and the outlaw bike culture was thriving on U.S. soil. While there is no actual stretch in the frame, the lines from the high peak of the gas tank flow sharply downhill to their nadir in the bucket of the rider’s saddle only to rise once again to the pillion pad. The overall effect of the vertical variation leaves us with at least the suggestion of some stretch, and though the Stryker lacks the triangular swingarm some manufacturers use when reaching for this look, the overall frame geometry leaves the impression that it could be a rigid, as long as you don’t look too closely. A big, skinny front wheel and wide, bulky rear tire completes the panache, and though it isn’t quite as faithful to the target look as say, its stablemate the Raider, it still demonstrates a fair amount of fidelity overall. Last year the Stryker came in a fetching Galaxy Blue color with some chrome sprinkled about. Its Bullet Cowl brother, which was not carried forward for 2017, sported Matte Gray sheet metal (literally, no plastic here) with the blackout treatment everywhere else. The cowl and the colors marked the major differences betwixt the two. For 2017, we have the Stryker standing alone in basic black. Yamaha uses a tubular-steel frame in a double-downtube, double-cradle configuration, with an open neck at the steering head. While the head is set with a caster angle of 34 degrees — a fairly wide angle by normal standards — the six-degree offset in the tripletree adds up to an overall rake of 40 degrees. I’m sure I don’t have to belabor the point as to how radical that much rake looks, especially on a production model. This bike is by no means an exercise in subtlety. Unlike its predecessors, and no doubt partially for legal reasons, the Stryker doesn’t handle like a chopper. Though the extreme rake pushes the front wheel out for a long, 68.9-inch wheelbase and 99.6-inch overall length, Yamaha manages to keep the trail reasonable at only 4.3 inches. This counteracts the flop-over front-end feeling you get with a home-built chopper, and keeps the minimum turning radius just under 140 inches, so it handles more or less like any other long bike, and is well behaved in the corners. The frame’s backbone yoke pushes the seat down to a mere 26.4 inches, close to the bottom edge of the range, so the ground is easily within reach for the vertically challenged. However, the forward controls may be a stretch, even uncomfortable, for the shortest riders, and the windsock rider position will exacerbate the problem as wind pressure and engine torque tries to push you even further away from your footrests. Salient point here is; test ride before you buy, especially if you have never ridden feet-first before. Aluminum rims come with five, saber-like spokes that do nothing to represent designs of years past, but they do look mighty cool. 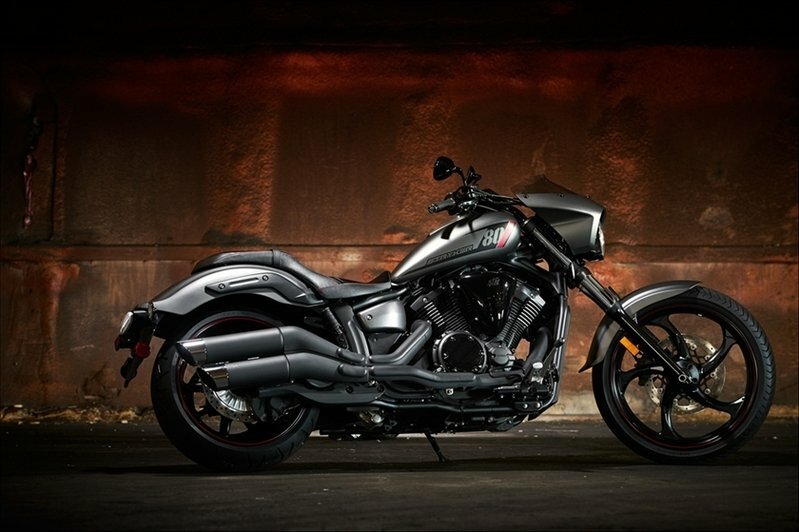 While the Stryker comes with polished aluminum for a bit of bling, last year’s Stryker Bullet Cowl model ran blackout rims that tied in with its overall dark-and-handsome look. A single, 320 mm disc and twin-piston hydraulic caliper bind the front wheel, with an uncommonly large, 310 mm disc and single-pot caliper binds the rear. Honestly, that may be a bit overkill for a rear brake disc, but since it runs a single disc up front and no ABS, I’ll take it. Just be careful not to stomp the pedal in a panic and you will be fine. Right-side-up front forks buoy the front on 5.3 inches of travel, and a hidden monoshock floats the rear on 3.9 inches of travel — not stellar, but just fine for most civilized roads. 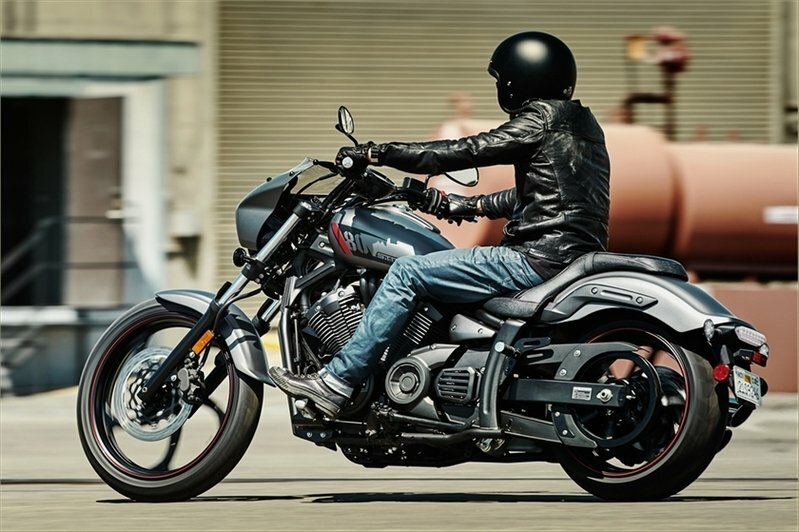 You cannot build a bike meant to hail back to American-made rides of the past without a big, V-twin engine — a fact not lost on Yamaha and the Star designers. 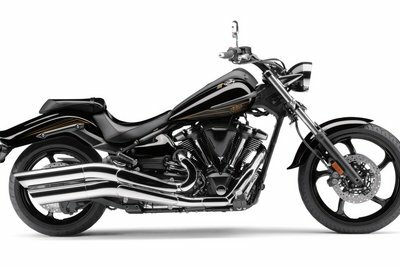 The factory stuffed an 80 cubic-inch (1,304 cc) mill into the frame for propulsion duties, and outwardly it fits the look but actually falls into the mid-size category since Harley and Indian (and Victory up until this year) started producing 100-plus inch engines as of late. 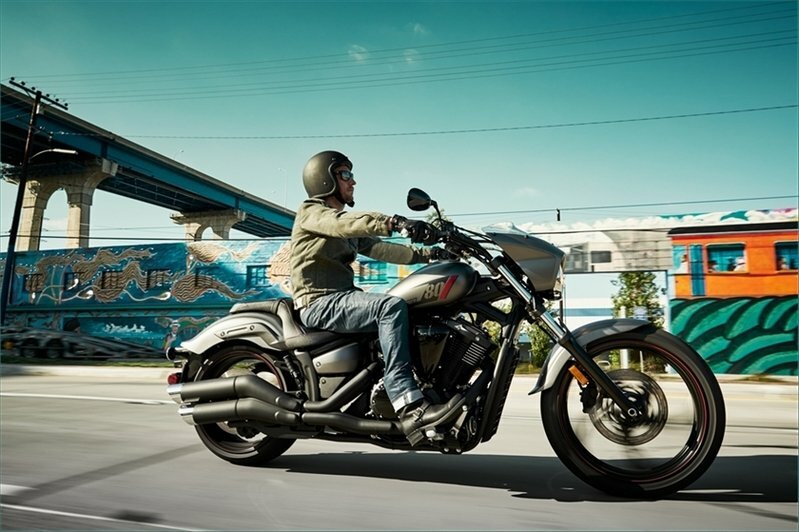 The 60-degree V-twin comes with cooling fins that furthers the look, but the water jacket on the engine and the radiator actually see to the cooling action. A 40 mm, Mikuni, dual-bore throttle body meters the air-fuel ratio, and the engine breathes through a pair of 36 mm intake valves and 32 mm exhaust valves, for a total of four per head. Usually, mid-size to large V-twins run in a long-stroke configuration, but the 100 mm bore and 83 mm stroke put it firmly in over-square, short stroke territory. 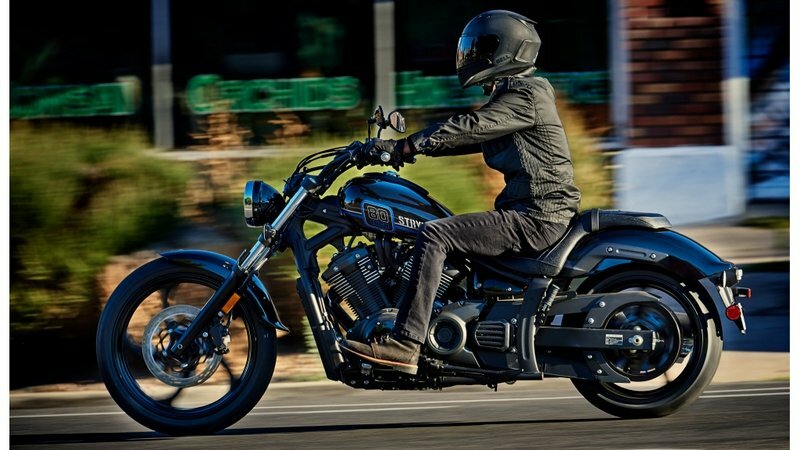 This leaves the engine with 78.8 pound-feet of grunt at 3,500 rpm, plenty for most around-town riding unless you plan to bet your pink slip on an ill-advised drag race. Ceramic plating on the piston bore reduces friction and wear to extend engine life, and the forged pistons help to reduce reciprocating mass to give the bearings in the lower end a break. 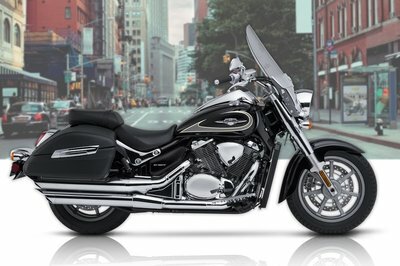 Best of all, Yamaha put both connecting rods on a common throw, so the engine has that distinctive lope that American cruiser riders find so attractive. The five-speed transmixxer and belt drive complete the running gear. 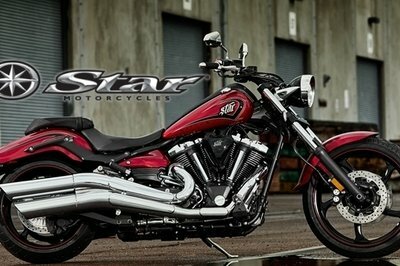 At $11,899, the Stryker is competitively priced, and it even puts big-bike function in reach of first-time buyers. Yamaha covers your ride with a 12-month limited factory warranty. Usually I would look for a model from a different manufacturer, but this time I want to look at Stryker’s stablemate in this raked family. Considering the look of the Stryker, and the type of rider it would appeal to, I find the Raider to fit the same general mold, and expect the same sort of rider to want to give it a look, so here we go. Visually, the Stryker and Raider display a fair amount of common DNA. They both bring the classic chopper look, and share similar lines across the board. The raked forks, deep-scoop seat and bobbed fenders make them look more like brothers, rather than close cousins. Once we move beyond casual visual observation, the differences become clear. While the Stryker looks sort of air-coolish because of the cooling fins on the jugs, the great big radiator gives it away, whereas the Raider runs with true air-cooling for a purer look. The same goes with the displacement. The Stryker mills look outwardly large, but only displaces 80 cubic-inches, whereas the Raider actually is a monster at 113 cubic-inches. It should be no surprise that this difference reflects in the performance numbers. While the Stryker is no kitten with its 78.8 pound-feet of grunt, the Raider comes out of the hole like a Siberian Tiger with a soul-crushing 123 pound-feet. Bottom line on the engines is: do you want to just look bad or do you want to be bad? The power difference shows up on the sticker. A skosh over 15 grand, the Raider falls around 4k proud of the Stryker. 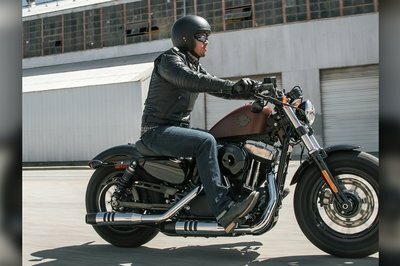 Granted, neither bike is for someone looking for cheap, basic transportation, though I would submit that both are less expensive than their main competitor, the Softail Breakout from Harley. Again it comes down to whether you are really a fiery-eyed pegdragger, or just a pegdragger-lite. So much of the American market is based on image, and the Stryker certainly fulfills that criterion quite well, so at the end of the day buyers will have to decide for themselves if image is enough, or if it is worth it to grab the tiger by the tail. I know which one I would choose. ::CoughRaidercoughcough::: ahem. Either way, Yamaha has something for everyone looking for a slice of classic Americana, and they offer a few choices for personal taste within a slender niche. Bravo, Yamaha. Bravo. My wife and fellow motorcycle writer, Allyn Hinton, says, "I’m not comfortable with my feet so far forward, maybe that’s because I’m a shorty-short, I don’t know. 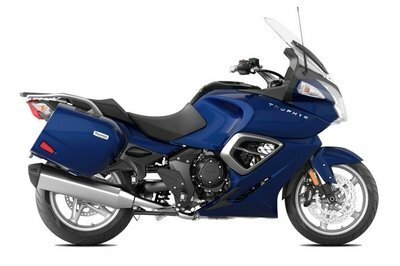 I said of the Stryker when I looked at it last year that it’s a nice mid-displacement cruiser for the money and I haven’t changed my mind. I still like it better than any of Suzuki’s Boulevard lineup. When stacked up against the Raider, I think I’d go Raider, myself."